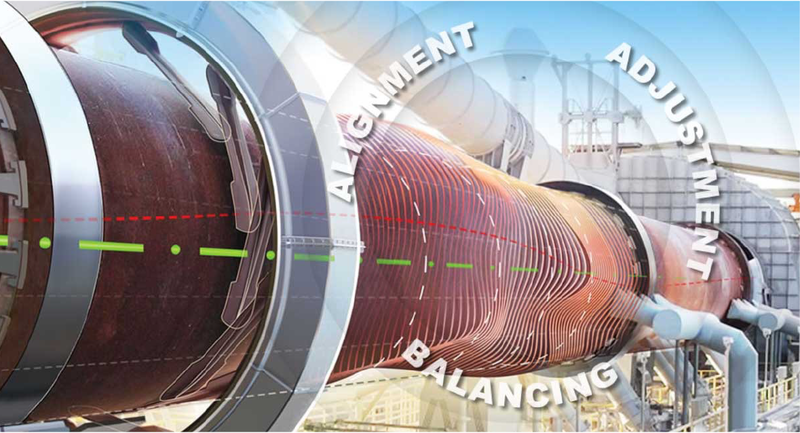 Rotary kiln alignment is well known preventive maintenance tool. The rotary kilns are affected by mechanical and technological stresses causing components wear and as consequence misalignment. Every kiln user wish to have high run-time factor and no unexpected fails and stoppages. Therefore the managers prefer preventive routines than costly repairs. Geoservex is a pioneer in hot kiln alignment in dynamical conditions. Since 1973 till today we have aligned and inspected hundreds of kilns, improving and upgrading our scope of analyzes. Our vast experience in this field is appreciated by all leading cement, paper and steel manufacturers in 46 countries of the World. Today Geoservex is a leading kiln alignment service provider worldwide. Our scope of works and quality of services fits the highest available standards. The kiln axis survey and adjustment, rollers position and profiles, shell deformation analysis and 3D modelling, radial and axial run-out of tires and girth gear, shell crank detection, kiln thrust balancing, drive mesh inspection, finally complete recalculation of kiln mechanical parameters, all in one comprehensive kiln inspection report. All global kiln manufacturers recommend to align the kilns on regular basis at least every 2 years. Sometimes service groups connected with kiln manufacturers concentrate on components replacement. Geoservex is an independent engineering company and service is our core business. We do alignments and inspections in order to safe cost of maintenance and our goal is to adjust existing equipment and improve the kiln condition and operation. We know from our practice, events when a kiln frequently has bearing overloads (hot bearings), shell cracks, roller shaft \ cracks, frame cracks in spite of measuring alignment and adjustment. In these cases, the kiln should be again mechanically verified. This process is reverse to design: the same parameters are checked but the kiln is real, and the process is based on real dimensions and production parameters. There are cases of an uneven distribution of support loads with simultaneous dimensional over design for stress the kiln shell, which lets the kiln axis position optimize. This technique has been known by producers for many decades but it is not widely offered. 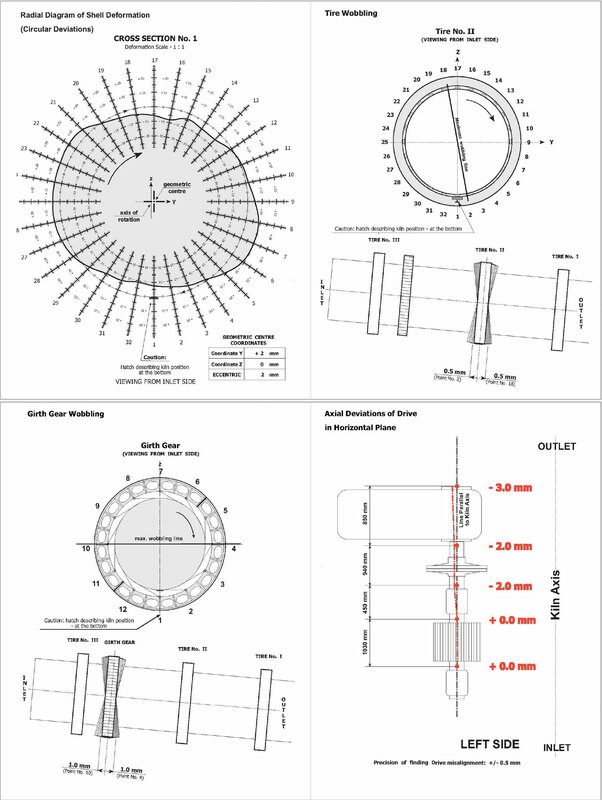 Measurements of rotary kiln shell deformation constitute a significant part of our extensive offer of kiln inspection. Geoservex was the pioneer in the field of these measurements, covering the scope ranging from simple measurements of distance and geometric approximation of a cross-section shape, to linear laser scanning and unique computer software development enabling the calculation of shell eccentricity in a particular cross-section and its shape deformation (circularity). The next step of the development of this service is our newest product – a three-dimensional computer animation of a rotating kiln shell, presenting its measured shape deformations (cross-section eccentricity and circularity deformations). Additionally, this model has been enhanced with a visualization of tyres rotation together with their wobbling (axial unbalance) and radial run-out. Preparation and submission of completed report including results of survey, short and long term recommendations for preventive maintenance actions. *All results must be treated solely as technical opinion. *Geoservex does not take any responsibility for changes in the kiln design. The above listed work will be done by the team of 2 Geoservex’s specialists within: four days for module 1, six days for modules 1+2 (+3 if apply), one extra day for modules 4 or 5. Adjustment supervision – module 6 is ordered and charged daily for Customer request. Each module includes reporting, all reports are prepared and presented on site. In some cases report for module 5 takes more time and is sent within 14 days. In case the adjustment supervision included in module 1 (4 hours) is not utilized within planned inspection time, as detailed above, the price for service remains firm. Geoservex assures the accuracy of kiln axis survey within +/- 1 mm and the accuracy of adjustment of kiln axis in horizontal and vertical plane below 1.5 mm. Geoservex ensure competent, fully trained, specialized and experienced engineers for measurement and adjustment of the kiln. Geoservex ensures technical consulting support of senior advising engineers for own teams as well as for Customer in case of untypical, complicated and complex problems with the kiln alignment, geometry deviation, operating and maintenance problems. The team of specialists is equipped with all necessary measuring devices including patented state of the art equipment, high precision laser range finder, high precision electronic theodolite, radiation pyrometer, digital gauges, induction sensors, own computer base, specialized calculation software, tripod. The complete equipment consists of 4 boxes of regular luggage size. Total weight of equipment is 100 kg (below 30 kg per box). The engineers PPE and small sensors are taken on board as overweight luggage. The Client shall determine the best time for execution of measurement and adjustment work considering that the kiln will be normally operating. The Client will delegate skilled technicians for assistance and help to surveying team for about 2 days per kiln. The technicians must be equipped with electrical drilling machine (suitable for concrete drilling) and basic hand tools. The Client will nominate team of competent and skilled technicians with good knowledge of organizing and executing rollers adjustment according to instructions and in presence of surveying team. The Client makes sure that the necessary equipment for use, e.g. : hydraulic jacks and pumps, hand hammers, spanners, cleaning brushes and cleaning sprays, etc is available and in working condition. The Client will support the measuring team with electrical power, locked equipment storage as near the kiln piers as possible, office room with air condition (if needed) and internet connection, free of charge. If the Client wishes to extend adjustment works (beyond minor works included in Module 1 or total 4 days for Module 1), additional days will be charged basis on daily charge per fully equipped team. Any claims for indemnities are excluded. Only in case of deliberate or grossly negligent behaviour by Geoservex employees, or in case of fundamental default in fulfilment of contract, Geoservex can be held liable. Geoservex liability is limited to the amount covered by insurance company.